Experience traditional hospitality & the dreamlike landscape of Tauferer Ahrntal – ideal for mountain lovers, skiers & families! Welcome to Hotel Mühlenerhof**** in Mühlen in Taufers! 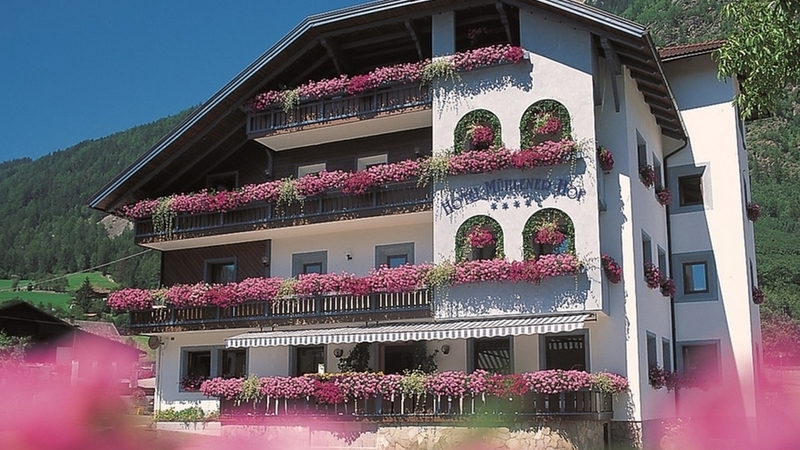 The traditional Mühlenerhof**** is a popular village inn and at the same time an inviting 4-star hotel with every comfort you may need for a pleasant stay. Here meet tradition and modern elements, cordial South Tyrolean hospitality and the sun of the south. You can find our sport and wellness hotel in the centre of Mühlen in Taufers – a quiet village in the wonderful natural landscape of Tauferer Valley. Time for relaxation is offered by the cosy double and family rooms in our Hotel Mühlenerhof, which are furnished with sofa or seating corner, phone, satellite TV, radio, safe, bathroom and balcony. The ¾-board includes a rich culinary offer, the use of the spa area with different saunas, an indoor pool and an area for relaxation as well as a large activity programme for the entire family. Whether summer or winter: in the surrounding mountains active vacationers and nature lovers will always get their money’s worth. There are waiting the family friendly skiing areas Speikboden and Klausberg or the popular ski mountain Kronplatz as well as other winter sports activities like cross-country skiing, sledging or snowshoe hiking in winter. The dreamlike mountains of Tauferer Ahrntal Valley offer numerous hiking tours for the whole family, exciting mountain bike tours and a wonderful bicycle path in summer. (Type A, approx. 20 – 23 m²) The comfortably furnished room offers enough space for two people, bathroom with shower, WC, cuddly bathrobes and sauna towels, hair-dryer, telephone, satellite-TV and safe. (Type B, approx. 20 – 23 m²) The comfortably furnished room offers enough space for two people, surrounding view from balcony, bathroom with shower, WC, cuddly bathrobes and sauna towels, hair-dryer, telephone, satellite-TV and safe. (Type C, approx. 30 – 40 m²) The comfortably furnished family room offers enough space for three or four people, some with balcony, bathroom with shower, WC, cuddly bathrobes and sauna towels, hair-dryer, telephone, satellite-TV, and safe. (Type D, approx. 25 – 30 m²) The comfortably furnished room offers enough space for two or three people, surrounding view from balcony, bathroom with shower, WC, cuddly bathrobes and sauna towels, hair-dryer, telephone, satellite-TV, safe and minibar. We had an amazing time at the Muhlener Hof! The people were amazing, the room was comfortable and the food...WOW! The Gala Dinner on Thursday night left us speechless! We will definitely return to this area and we recommend room 311. The views are amazing! Take the tram ride and hike. You will not be disappointed! Even in the rain, thunder and lightning! Intimidating, exhilerating, breathtaking (in the literal sense as well)!